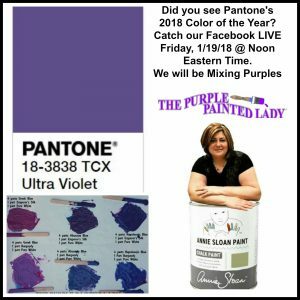 Pantone’s color of 2018 is called Ultra Violet! We decided to play with some different Chalk Paint® by Annie Sloan colors to create different shades of violet or purples. See the results below or Check out this YouTube video on The Purple Painted Lady Channel by Courtney and Trish at The PURPLE Painted Lady mixing up various violets and shades of purple. Please feel free to save these to your Pinterest boards!!!! 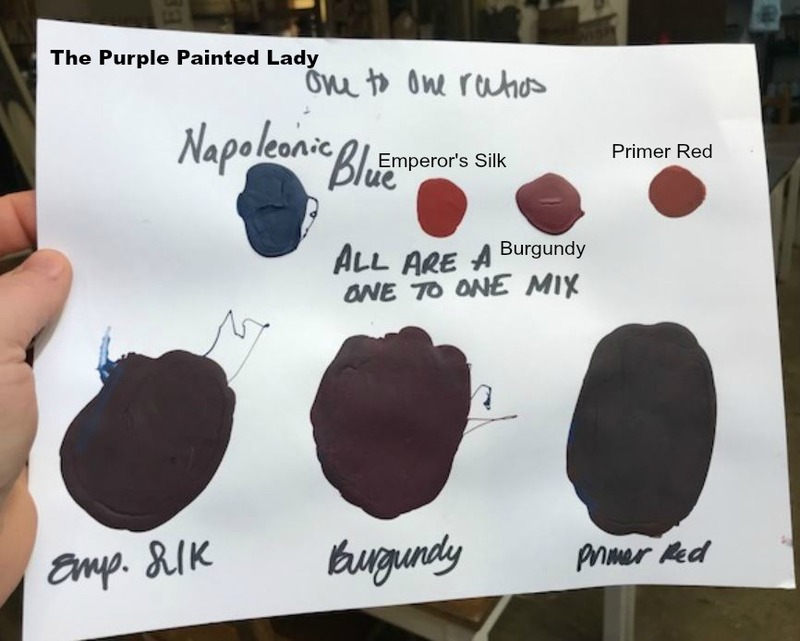 Napoleonic Blue mixed one to one with Emperor’s Silk, Burgundy and Primer Red Chalk Paint Colors. 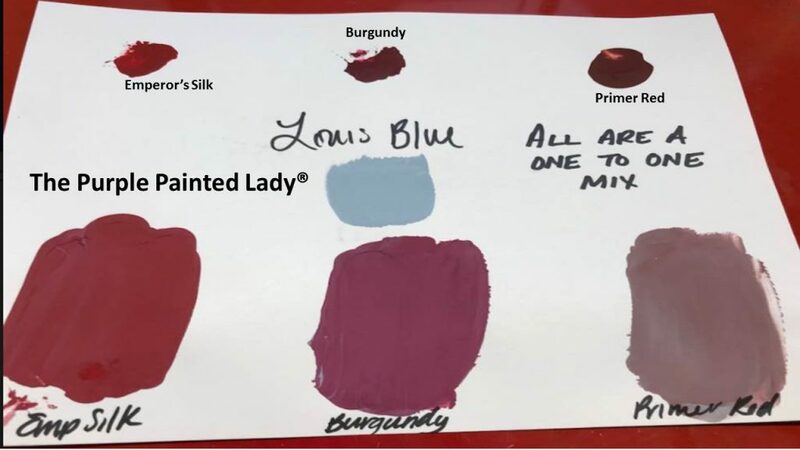 Aubusson Blue mixed one to one with Emperor’s Silk, Burgundy and Primer Red Chalk Paint Colors. 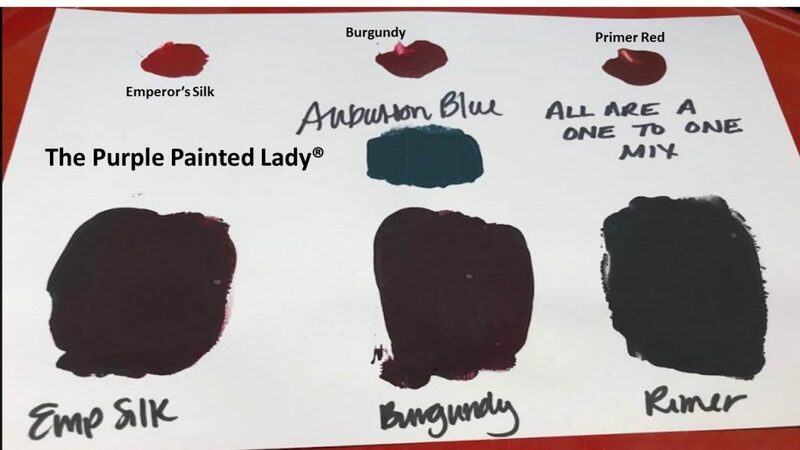 Giverny mixed one to one with Emperor’s Silk, Burgundy and Primer Red Chalk Paint Colors. 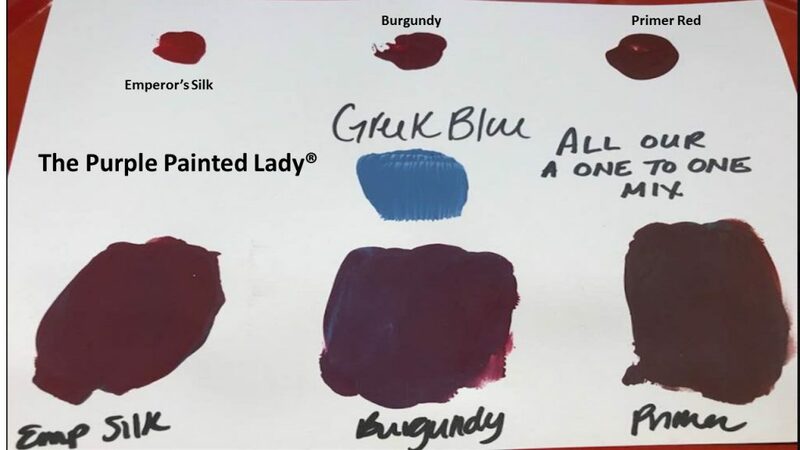 Greek Blue mixed one to one with Emperor’s Silk, Burgundy and Primer Red Chalk Paint Colors. 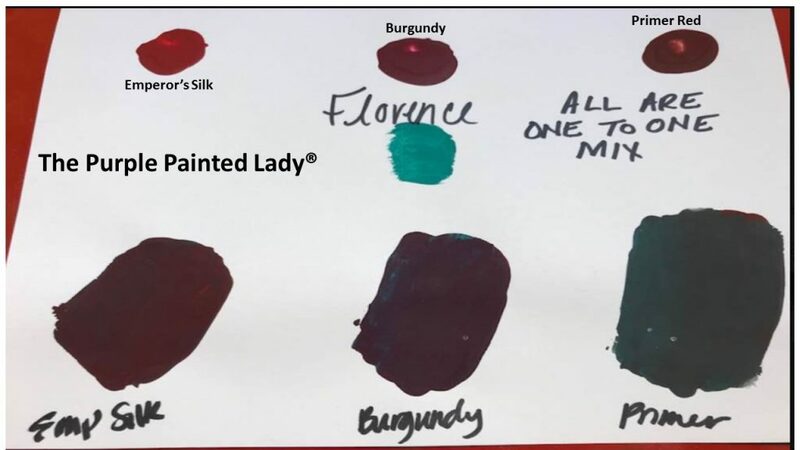 Florence mixed one to one with Emperor’s Silk, Burgundy and Primer Red Chalk Paint Colors. First- if you have a local stockist- go visit them and build a relationship with them. Go to them with your questions and project issues. BUT- if you do not have a local stockist- we invite you to try our customer service! 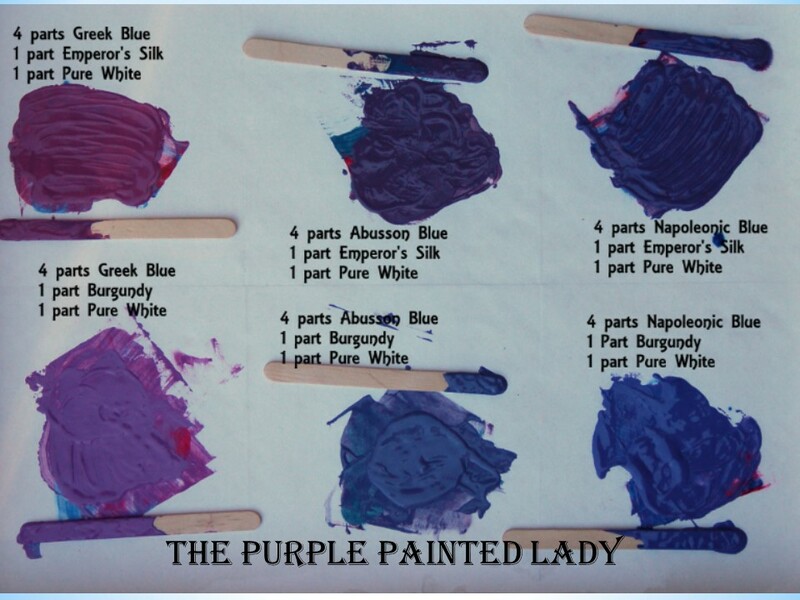 Paint Your Dark Cabinets……..don’t be afraid because The Purple Painted Lady is here to help you! 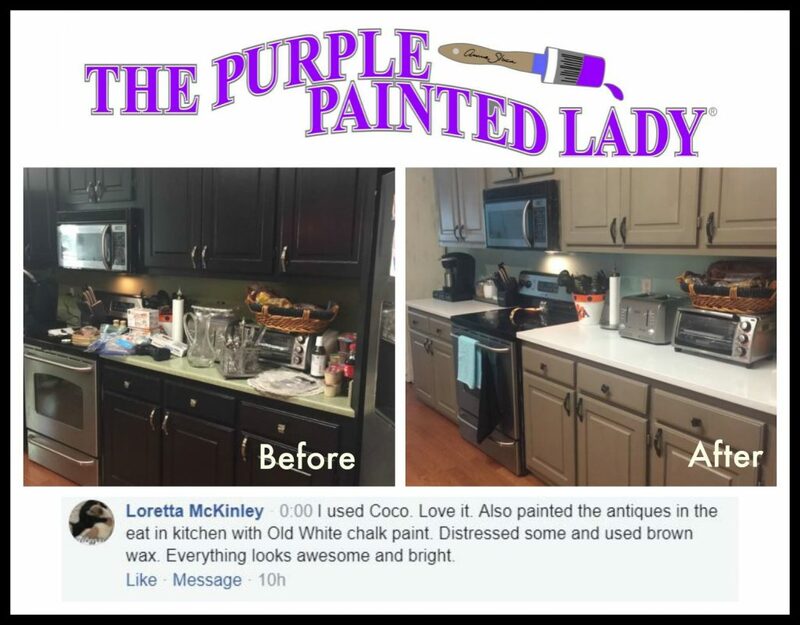 Here is a photo from our customer Loretta McKinley who painted her dark black cabinets with Coco Chalk Paint® by Annie Sloan and used dark wax. Below are a couple of links to full length tutorial and intense information for painting your cabinets. The videos are literally like taking a workshop with The purple Painted Lady, but …..instead they are free. After having my shop for 8 years and have helped literally, thousands of people transform their dark cabinets to something lighter, brighter and fresh…. all of us at The Purple Painted Lady are here to help you too! it’s affordable! For an average size kitchen, you can purchase your product and tools to transform it for under $300! it’s okay to paint wood…especially if you do not like it! Life is short…eat the cake! But more importantly, painted cabinets are more appealing during resale. you will be happier living in your space….and why shouldn’t you like where you live? • Become familiar with your painting technique. If painting cabinets is new to you, consider painting a small piece of furniture first to get used to applying both the paint and wax. It can also be helpful to have a small scrap piece of wood available in your workspace as a surface on which to test each step of your process before proceeding to the cabinets. 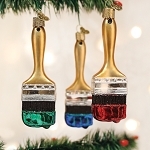 • If you are painting with a custom color, be sure to mix enough paint for the entire job. • Paint in the way the cabinet doors are constructed. If the doors are typical five-piece construction, paint the center panel first and then proceed to the rails and stiles, using the brush to create a nice line where the rail joins the stile. Use even brush strokes and don’t overload the brush with paint. When painting the rails and stiles, start painting on the outer edges and work your way in towards the center panel to avoid excess paint pooling where the panel joins the other components. • To help ensure a consistent look, complete each step of your finish across all of your cabinets before proceeding to the next. Now, we have a bunch of posts here on our website sharing tips and tricks and instructions on how to paint your cabinets, but this week we decided to share some real life video! So, catch us on our YOUTUBE channel while we paint the cabinets shown below with Old White Chalk Paint® by Annie Sloan. “The subject of painting over Thermo-Foil or other types of foil-finished cabinets comes up often. I know some of you do it and it may look good for awhile, but I really have to discourage you from doing so. These foil finishes are very sensitive to heat and moisture which can cause the foil to peel away, taking any paint finish with it. Also, paints of any kind will not bond to these materials and can eventually chip and scratch from normal wear and tear. I spoke last month at the Surface & Panel Symposium in Milwaukee which was attended by prominant printers, foilers, and cabinet manufacturers in the US and Canada. I made a point of asking various ones if their surfaces could be painted and their answer was a resounding NO. The good news is they are working on a paintable version to address the needs of the design community. The bad news … engineered cabinets with foil finishes is the future. They are being produced in various wood patterns, colors, and texture, and they truly amaze the eye and the hand. While we have been used to seeing foil finishes in white or beige applied as a sheet over solid doors, I saw it being applied to the individual components … center panels, rails, and stiles … for the more classic 5-piece constructed doors. They are making great strides in the stability of these finishes so heat and moisture problems will be a thing of the past. I believe it will be in our best interest to stress to customers that Chalk Paint® is a wonderful option … for wood and the occasional laminate cabinets. This is a high level of the order on what to do…so, make sure to still read the individual instructions for paint and wax for detailed info! 2. Remove hardware (Have an old home? – I leave the hardware in that cabinet’s cavity in a plastic bag so to know which door it goes to- keeping screws with their original hardware and doors is helpful.) Numbering cabinets can be helpful too. 4. IF changing the hole orientation with new hardware – Fill holes from old hardware with wood filler and sand once it is dry. 5. Drill new hole locations. 6. If you need to use shellac…use new Zinsser Bullseye Clears Shellac (spray or brush/rub on) on and allow dry time- 2 thin, uniform coats are best. If you used wood filler you will probably HAVE TO shellac the doors. Lightly sand with 200 grit. Do not break through shellac. NOTE! Most times you do NOT need to use shellac! 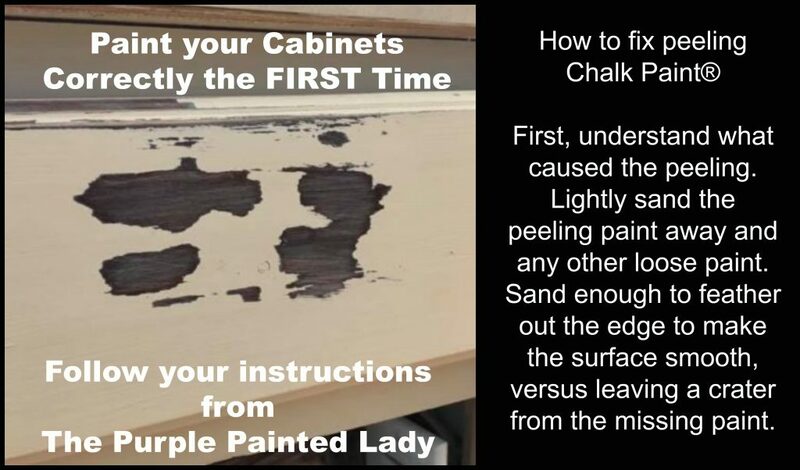 => So, do a test by applying Chalk Paint® without shellac on one door that is seen the least,….if you have no bleeding of tannin- skip this “sealing” step. If you get bleeding after 1st coat of chalk paint®- apply shellac over paint once dry. NEVER apply shellac over wax! I like to apply shellac with a rag- NOT a brush. 7. NOW the fun part…..PAINT! 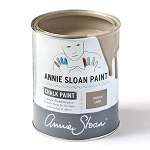 We love to use the Annie Sloan 2” Flat Brush. 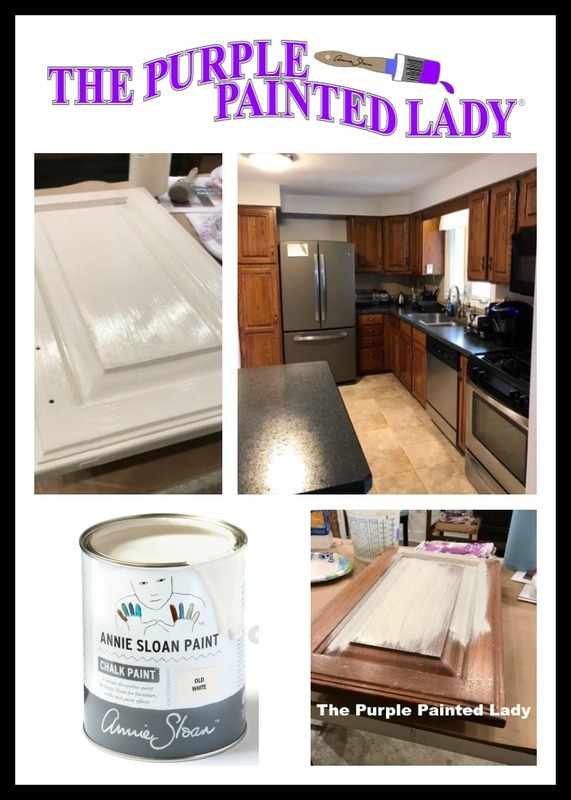 (https://shop.thepurplepaintedlady.com/Chalk-Paint-Flat-Brush-Large-by-Annie-Sloan_p_174.html) If painting the backs of the door- which I always do even with just one coat- paint backs first, and finish them all the way to completion using your top coat. Always “practice painting” and apply wax on the back of the doors before starting the fronts- which are the most important side of the doors, right? Want a smoother finish- thin your paint with a little water. Maybe 20%? (Paint most likely 2 coats…could be three depending on color and technique) Apply first coat and wait 24 hours…..if possible. APPLYING THE SECOND COAT: I will often use my Fine Mist Spray Bottle (https://shop.thepurplepaintedlady.com/Fine-Mist-Sprayers-10-oz-Clear–Great-To-Use-When-Applying-a-Wash_p_883.html) filled with water. I lightly mist the dried paint and then immediately apply my second coat. This light mist of water acts like a slip coat and makes painting the second coat easier and smoother. Always allow ample dry time. Always end painting a section with a clean finishing stroke from end to end. 8. Again…the number of coats is dependent on desired look – LIGHT sanding the surface after 2nd coat with 220 or higher grit sandpaper will create a smoother finish -ONLY IF DESIRED…but this is not required. Stay away from the edges if you do not want to break thru the paint to show base cabinet. 9. WANT A WORN DISTRESSED LOOK? 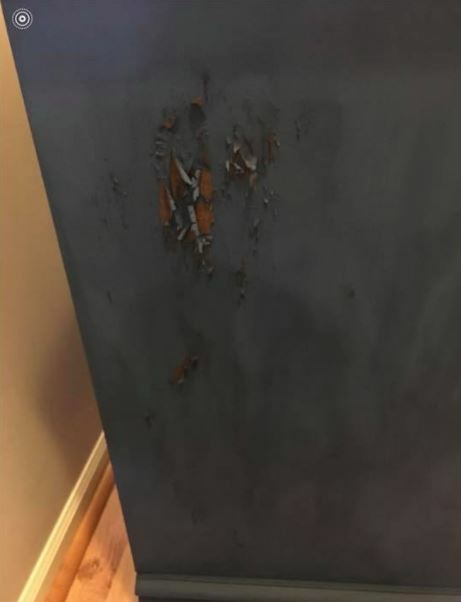 Distress edges and corners of cabinets with sandpaper …then blow dust off! I do this outside in the garage or outside if nice weather. 10. Top coat the cabinets using Clear Wax (2 coats is optimal – (follow our wax instructions!!!) Make sure you can glide your hand on the wax surface after removing excess wax. If using Dark Wax or making a glaze – apply after 1st or 2nd coat of clear wax. Try using Annie’s FINE Sanding Pad on the wax surface after it has cured to get a shinier finish- use with GENTLE pressure. Dark Wax is the last step of your whole project. Unless you are using Metallic Gilding Wax to embellish details- then the gilding goes on last. 2. Warming the paint helps and thinning with warm water also works. Thinning about 10%. 3. Having my shop and doors heated to about 70 degrees makes a difference. 4. Also playing around with the sprayers spray pattern settings was needed. Friends don’t let friends paint in situations where peeling will occur! 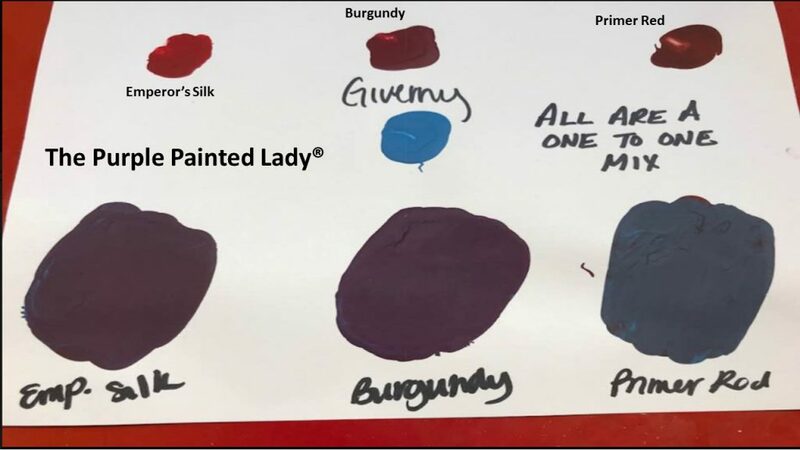 If there is one thing you can take away from this post- it is to please read the instructions that The Purple Painted Lady provides with your product purchases. They are really important and will help you be successful the first time you use your products. So, for example I thought I would share a couple calls I received this weekend from customers calling with problems. 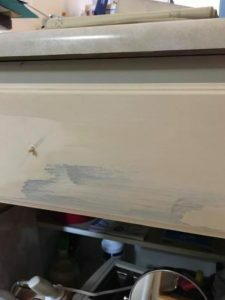 Customer calls that Chalk Paint® is peeling off of cabinets in specific areas. TRISH: (ring,ring) Hello, this is Trish, The Purple Painted lady. How can I help you? CALLER: I am working on painting a friend’s kitchen. I painted my boyfriend’s kitchen already and it turned out awesome, but on this project, I have one coat of paint and it is peeling. Why is this happening? TRISH: Okay, Are you using Chalk Paint®? Temperature. If you are painting in an area where it may be too cold, like under a constant 60 degrees. What type of surface are you painting? You do not want to paint over Thermafoil. 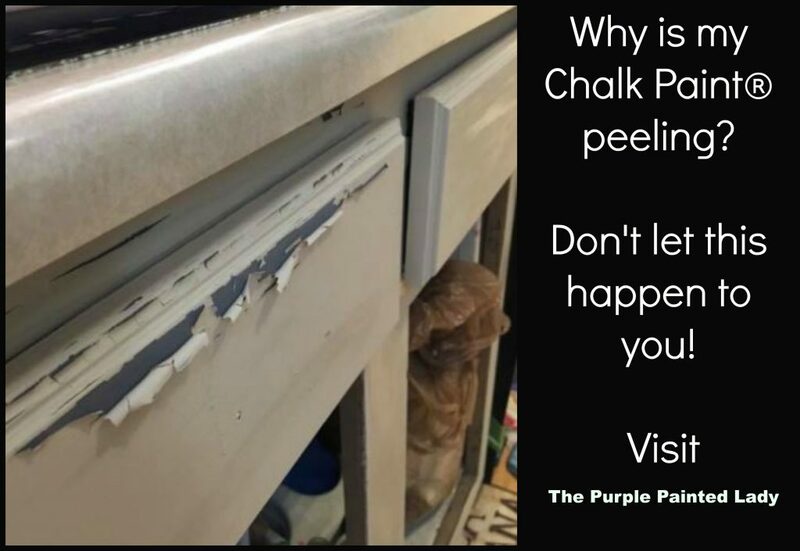 Is the peeling happening all over or just in some spots…like near the sink, dishwasher, over the stove, an area near a pet’s food dish or near a garbage can? CUSTOMER: Yes, it is peeling only in a few spots. Like right below the sink, a corner near a handle and above the stove. ** since the peeling is only happening in a few spots – this leads me to believe that the problem is isolated to areas that were not properly cleaned. They can be dirtier than other areas and may have needed some extra TLC or someone missed cleaning them as well as they should have been. Per our instructions, I recommend to clean cabinets, to follow our 2 step process. Wipe down the cabinets with a rag moistened with odorless mineral spirits (NOT the milky white environmentally green kind.) We like to use the Kleen Strip brand due to the fact that just because a product is labeled “odorless” – does NOT mean that is totally true. 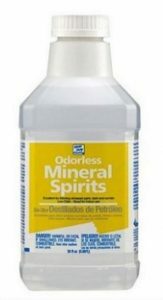 Some “odorless” mineral spirits still have a very strong smell. We like this brand better than others.) Once all of the cabinet doors and casement have been wiped down with the a rag moistened with odorless mineral spirits, then go back and follow up using a new rag moistened with fresh water to wipe them again….rewetting and rinsing the rag periodically. When using the odorless mineral spirits or the rag with freshwater, neither should be dripping wet! Sometimes, depending on the amount of crud that may be on a door or area, you may need to use a Scotch-Brite scrubby. This could be because of where your pet’s food dish is located, or a garbage can is near a cabinet and people miss when throwing things away or by the kitchen sink….. So, in order to clean off any extra “stuff“ for lack of better words …. meaning “filth, grime or crud” use a Scotch-Brite scrubby. CALLER: I left the cleaning to my friend. TRISH: They either did not clean well enough or they did not wipe with fresh water thoroughly enough afterwards. It could be both? CALLER: What do I do now? TRISH: I recommend that you lightly sand the peeling paint away and any other loose paint. Sand enough to feather out the edge to make the surface smooth, versus leaving a crater from the missing paint. Sand enough of that area to lightly remove any potential left behind residue. Then wipe away any dust. Lightly paint over that area and let it dry. This should a thin coat, but with total coverage. It should not re-peel….but if it did and you followed our instructions…text Trish! Her number is on your instruction sheets. 2. TEMPERATURE is a factor with paint products…….in fact, ….temperature is a big deal! Never store or use your paint products or top coats in the cold! Never store them where it will be less than 55 degrees too! It’s important that when painting anything ……that the paint is at room temperature ….and the piece being painted, such as a cabinet door or a dresser is at room temperature too. Meaning, you cannot go out to the cold garage turn on a heater for the limited time you are in there and then turn it off, when you leave…..but leave your paint and painted piece to suffer in the cold….your project will fail! This also means, if you are bringing in a piece from the cold garage and immediately start painting it just because you are in your warm home. The material, be it wood or otherwise of the dresser or cabinet needs to be at room temperature also. This may mean, you may need to wait a few hours before starting to paint. Once done painting, while the paint dries the piece has to stay at room temperature through the entire curing process. And just for good measure- I thought I would share a little more about painting cabinets. Paint is basically, all chemistry. It’s a liquid that when dries….. people expect it to be as strong as a military tank. That just doesn’t happen by magic. When people are painting their kitchen cabinets (or floors or laminate/Formica surfaces…or really smooth surfaces ) ……..if possible always apply the first coat of paint in a uniform, thin application, but where you still get complete coverage. Then……. (if possible) wait til the following day to paint a second coat. Yes, I know we share that you can paint or wax a total of three applications in one day …..but by waiting for that first coat to set, like overnight …..the better it will be on the cabinets. I also tell customers to not try to scratch the paint with their thumbnail and see if they can scratch some off……because guess what….. you will be successful. This would happen no matter what paint line you’re using. If fact, many paints have a 30 to 45 day cure time. Chalk Paint® is very unique in that, as long as you are gentle initially- you can begin using your painted and waxed piece immediately. This combination is extremely durable but again, you have to allow some time for the chemistry to do it’s thing. Here is a link to a post I wrote about painting over super smooth surfacses like laminate or formica.